Although I began my infatuation with American Girl many, many, many, years ago, my love for AG grew tenfold after my first visit to the American Girl store in Minneapolis last summer where catalog photos materialized into a magical world made just for girls. It wasn't just shopping, it was an experience. From the moment I saw the big red sign with giant white letters, American Girl captured my heart again. Seeing all the little display areas set up with adorable dolls, accessories and scenes I wanted to have everything. I was a kid again and began making my wish lists, circling pictures of the dolls I wanted, for my girls of course, as I had once done to the Sears Catalog at Christmas. The artist in me was inspired to create scenes and backdrops to enhance my girls creative play. And I supplemented our growing collection with homemade pieces when the price of something ate at my rational brain. 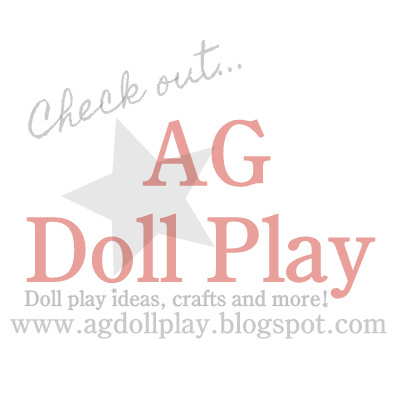 When I placed my first mail order purchase, a new doll for my oldest daughter Gracie, I poured over the AG website, and chose Marie Grace whose stories took place in New Orleans at the same time as the stories of my beloved Kirsten. I thought she would be the ONE doll my own daughter would collect. A few months later, on our first excursion to the AG Place, where I anticipated Gracie adding Marie Graces furniture, Gracie had a love of her own-Julie Albright. We left, having spent more money than I like to admit, with Julie, Ivy, a few outfits for each, accessories and hearts filled with joyful memories of seeing all things little girl. The personal shoppers who helped us knew how to make girls with their dolls feel special, and the restaurant was an experience all it's own! And that is where it began, before summers end we went to the AG store Chicago, and had a mile long list of dolls and accessories we wanted. Before long I was a frequent visitor of the American Girl Outlet Store, always perusing for a bargain and occasionally picking up a full price item or two to save on shipping. Finding an occasional discontinued outfit for $10-$12 was the highlight of my shopping! Then, this summer I discovered the big SALES, and suddenly my girls large collection is going to be enormous! Until this summer my heart was wrapped around the historical dolls and only filling their collections. We did add the guitar to Julie's room because that one just made sense and Julie also wears head gear at our house! We added Kit and our JLY with blonde hair that seemed more manageable for my 5 year old than the new Caroline, but she is named Caroline and wears Caroline's clothes. As summer approached I learned of two large sales that take place in Wisconsin each year. The MCM Sale was the start of my recent over-purchasing! This sale is 2 days, and you need tickets to go on Saturday where McKenna, Kanani, and Felicity ($100) were available as well as Kirsten's retired pjs! I missed out on these deals, but waited in line on Sunday for ticket and realized that people who came in the morning even after the sale started, still had a large selection of dolls to choose from including Ivy, Marie Grace and Addy! I picked up 7, yes S-E-V-E-N, new American Girl Dolls! Saving $70 on the historical dolls (each buyer was limited to 1) and saving $80-$90 on the JLY, I couldn't help myself! I found an eighth doll for $3 at Goodwill the very next day and my youngest picked out her first bitty baby at the sale. ( I am afraid this has temporarily replaced her American Doll as her new favorite.) 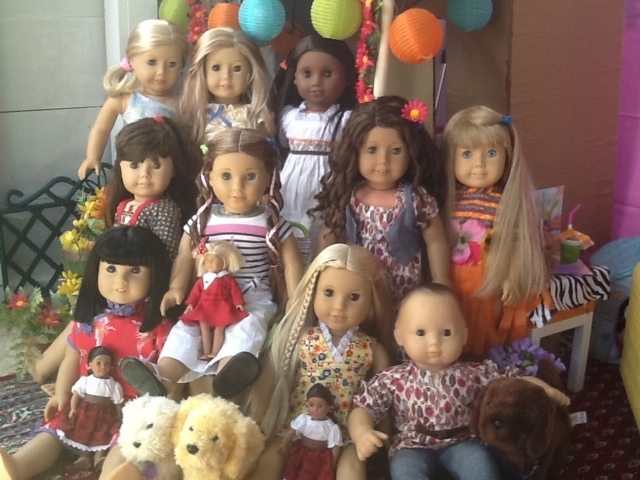 Over the top, more than doubling our number of dolls in one day! My girls came to the sale with me and know most of the dolls I picked up, they each only got one of the new dolls, with the rest being hidden away for 'some other day'. I brought my mom to help with my girls who are 6 and 9, but in the future I would not bring kids. It was worse than Black Friday, competing with eBay re-sellers who didn't care what flaws the dolls had and just grabbed doll after doll. Yes, these dolls are mostly returns and seconds and have flaws of some kind. Most noticeably were the wig and eye problems, although I did end up picking up an Ivy doll for a friend with slightly green ears from her earrings and a wobbly head (easy fix!). Our dolls do have some wig problems, wrinkles in the wig cap, thin hair, or places where the wig cap shows. For the price, I can live with these small flaws! There were also a limited supply of clothing, books and mini dolls there as well. I have had enough shopping for American Girl, right? WRONG, three weeks later, I decided to see what the American Girl Outlet Inventory Reduction Sale was all about! Yikes! It was amazing and I over-bought again, but at the reduced prices at the sale I felt like I could not pass up the historical items, and there were a lot, furniture, pets and books they had...even when they were for dolls that we don't have but are on our list of 'some day' dolls. While shopping, I kept telling myself that I could always sell something if I decide later that I don't want it, right?? I am so excited for this Christmas! My highlight was finding McKenna's beam and bar set AND her loft bed with all it's accessories! I also picked out the dreamy night stand, the bitty baby booster seat, doll outfits, doll-play salon books, novels, the travel set, Rebecca's lunch set, mini dolls and pet sets. My daughter had her birthday after the sales and for less than what one new doll with it's accessories would have cost from AG, she got a new JLY AG doll with pierced ears, the genie costume, the skateboard set (outfit with skateboard), Cecile's pajama set with robe and slippers, the dreamy bedside table with it's accessories and a non-AG doll/girl matching dress from India. Now, the dilemma I am having is that before any of this shopping, my daughter wanted Saige...so I bought her and many pieces from her collection and stuck them away. Return? Return or keep, return or keep? Now do we need Saige...did we need any of it? I am officially banning myself from attending another 'sale' and I really have to stay off the web too! I have no self-control and cannot pass up a bargain when it comes to American Girl! Been there, done that three times, so far. ;-) My daughter is 18 and we went to the MCM sale this summer also. We always drag my husband along to help carry. When we were there two years ago we came home with 11 dolls, a few were gifts. This year we made it home with 14 dolls, 10 were gifts (we're getting better). My goal for the sale was to get Kanani even though I knew the odds weren't good. I think the first person in line could have got her, but they were all gone by 7:15. Once we finished shopping we went outside to shop and wouldn't you know but there was Kanani up for auction/buy it now. By the time I got there they had two (of four) left. So I did come home with a Kanani and MCM got a nice donation. ;-) Oh and we're up to 37 AG dolls not including a few minis and other brands. My husband has taken to rolling his eyes. Wow, you lucked out! I met a gal in line who had a similar Felicity experience on Saturday! This was our first time, and I am certain I will be making both an annual outing. I talked my mom into taking 2 AG dolls to give the girls at Christmas, leaving me with 4 right now. So 2 from me at Christmas, and only 2 more left to figure out when to give the girls. Not to bad. But, I can see our family of dolls will be growing quickly with plans to return each year. I say keep. Saige is only a one-time deal. Or you could use that as a positive to sell on ebay and even turn a profit on the whole thing. I am so jealous of those of you who live near enough to go to AG place!!!!!!! I really want to be able to go to a benefit sale, because the dolls are so cheap there, and the money goes to charity, which is a great thing! This makes me feel better about my daughter's ever growing collection:) It is soooo hard to resist! I have to say my daughter got Saige for her birthday in January and we LOVE her! She is so pretty and her hair is really fun to play with and easy to take care. My daughter is 7 and does a fantastic job with it. Loved hearing your story! What was the price range of the American girl dolls?